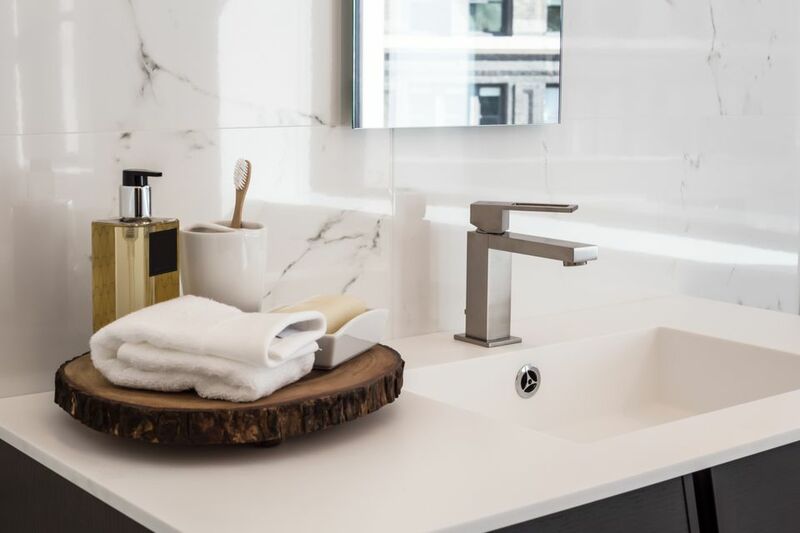 Upgrading your bathroom vanity, countertop surface, sink, and the faucet is one of the best home repair upgrades in which you can invest. Removing an old bathroom vanity and installing a new stylish vanity will remake your bathroom. In the process, you will be installing a new faucet. 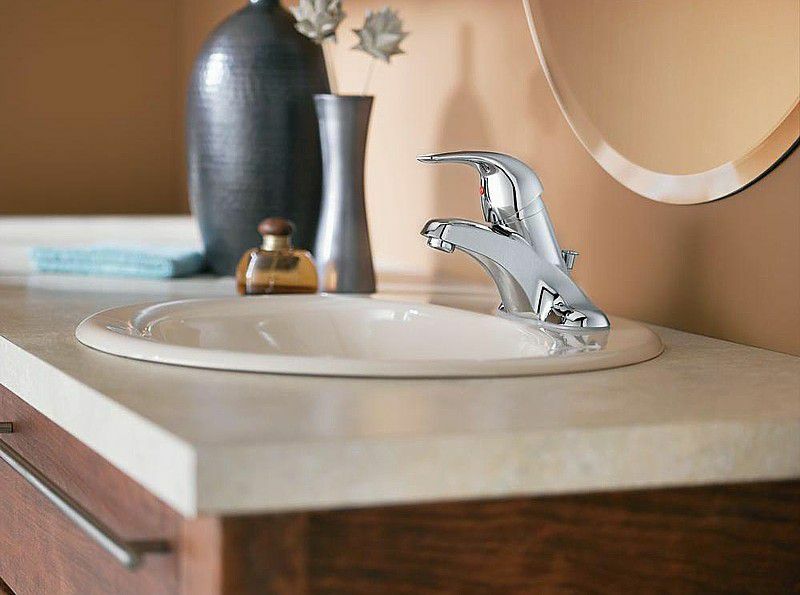 In this tutorial, we will provide you a photo-rich visual guide to installing a new 4" centerset single-handle cartridge faucet in a new vanity top. The single handle cartridge faucet is a popular choice for kitchen and baths and comes in a seemingly endless variety of styles. This tutorial shows a trick installation of the faucet into a new vanity top, in this case, a granite top with an undermount sink. The "trick" is to flip the vanity top upside down and make all the connections of the faucet to the top before the top is installed into the vanity. This makes the faucet installation very easy. Attach mounting brackets to threaded rods on each side of the faucet and fasten retaining nuts leaving a few threads exposed. Place the plastic gasket on top of the vanity top ​and over the sink holes making sure to correctly orient the gasket. Carefully insert the faucet body and threaded rods into the faucet holes by angling the mounting brackets so they can fit through the mounting holes. Ensure flush and proper fitment/alignment of the faucet onto the plastic gasket. Secure the faucet to the vanity top by tightening the mounting brackets flush against the underside of the top, making sure the bracket spans completely across the faucet hole. You can use an adjustable wrench or a closed end wrench (as shown in the photo) or a basin wrench if space is limited. Once the faucet is attached to the top, attach the hot and cold water supply lines to the faucet. The supply lines will have a rubber washer on one end and that is the end that attaches to the faucet hot/cold water lines. Snug the connection but do not overtighten. Attach the sink drain flange to the vanity sink by sealing the underside of the drain flange with a waterproofing sealant. You can use plumber's putty. An alternative to plumber's putty is to use clear silicone caulk around the perimeter of the drain. Fasten the drain flange to the sink by securely tightening the large retaining nut to the drain flange tailpiece. Flip the top over and clean any putty or caulk residue which has oozed out from under the drain flange with rubbing alcohol. Place the rubber O-ring onto the drain flange tailpiece. It will seal the connection to the pop-up tailpiece. Tighten the pop-up tailpiece with the pop-up opening facing to the rear. Insert the pop-up ball and pivot rod into the pop-up tailpiece. Make sure the pivot rod is inserted into the little hole at the bottom of the pop-up drain piece. Replace the pivot rod retaining nut and finger tighten. The pop-up drain is controlled by a lift rod. There is a lift rod bracket that attaches to the lift rod with what is called a clevis screw. Drop the lift rod through the rod hole on the top of the faucet. Insert it into the flat bracket and temporarily secure with the clevis bolt. The final location of the clevis screw attachment will be determined with the final adjustment of the pop-up drain. Secure the lift rod to the pop-up drain pivot rod with the spring clamp as shown. It gets installed first though the pivot rod, then through the lift rod, then again through the pivot rod. Adjust the height of the pop-up drain so it is raised 1/2" when the lift rod is fully depressed and is sealed against the sink drain flange when the lift rod is raised. You may have to alter the location of the clevis screw and/or the lift rod clip to get the proper action of the pop-up drain. With the faucet installed into the sink, install the vanity top into the bathroom vanity.